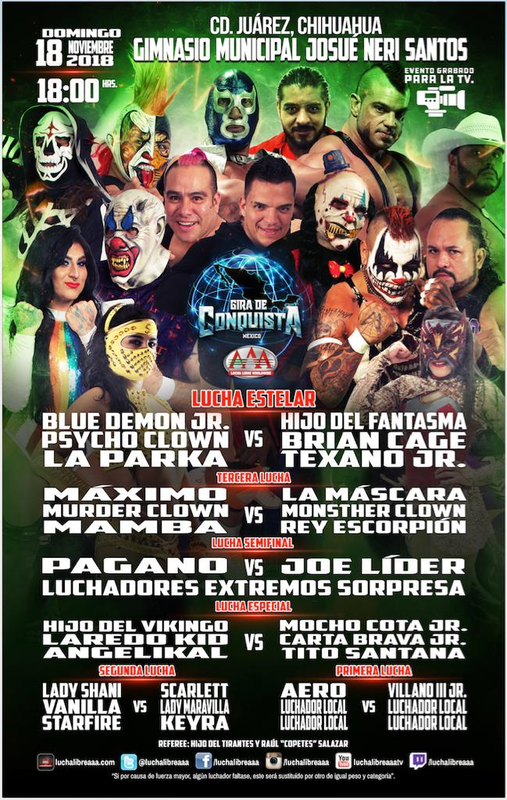 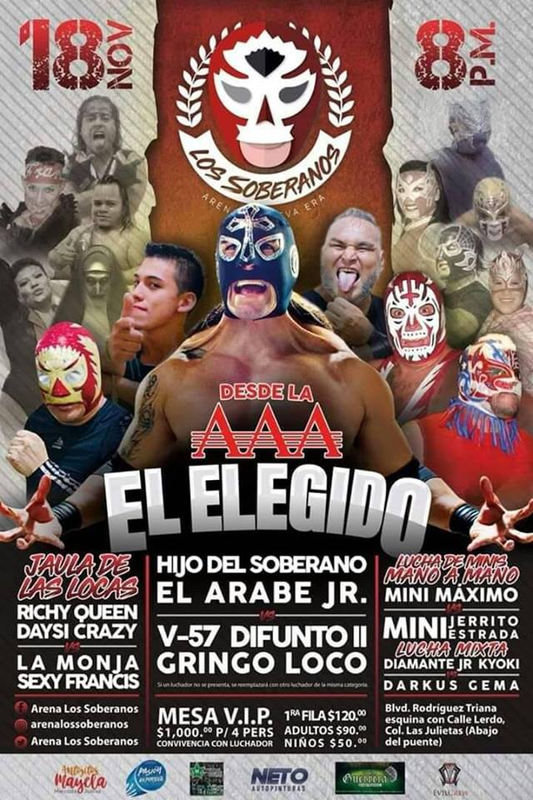 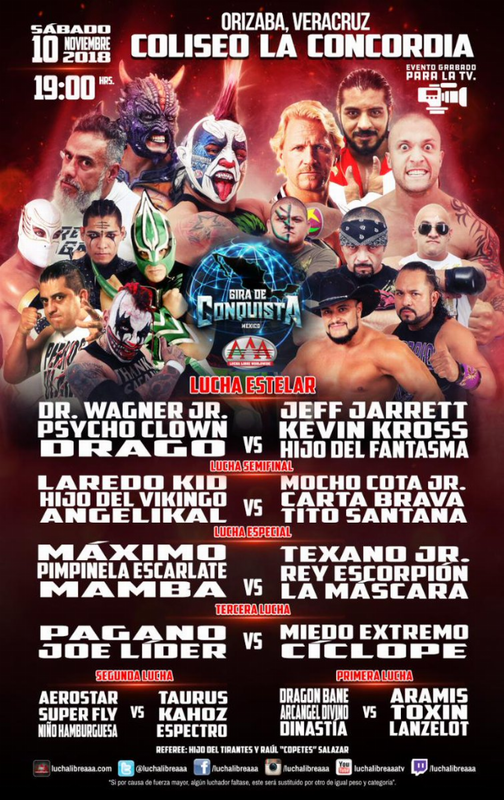 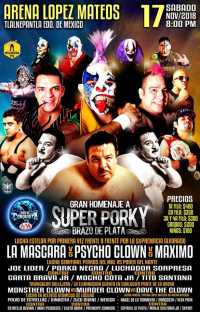 3) Angelikal, Hijo Del Vikingo, Niño Hamburguesa vs Halcón 78 Jr., Loco Max, Villano III Jr.
4) Crazy Boy & Niño Hamburguesa vs Carta Brava Jr. & Mocho Cota Jr.
2) Chicano & Lanzelot vs Tiger Boy & Villano III Jr.
1) Angeliak & Hijo Del Vikingo vs Tiger Boy & Villano III Jr.
1) Sakiel & Ying Dragón vs Rey Supremo & Serpiente China Jr. 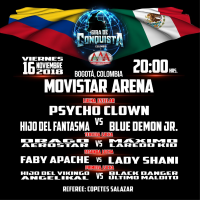 Event Notes: A match featuring Colombia wrestlers opened the show, and went to no-finish when Fantasma and Konnan attacked. 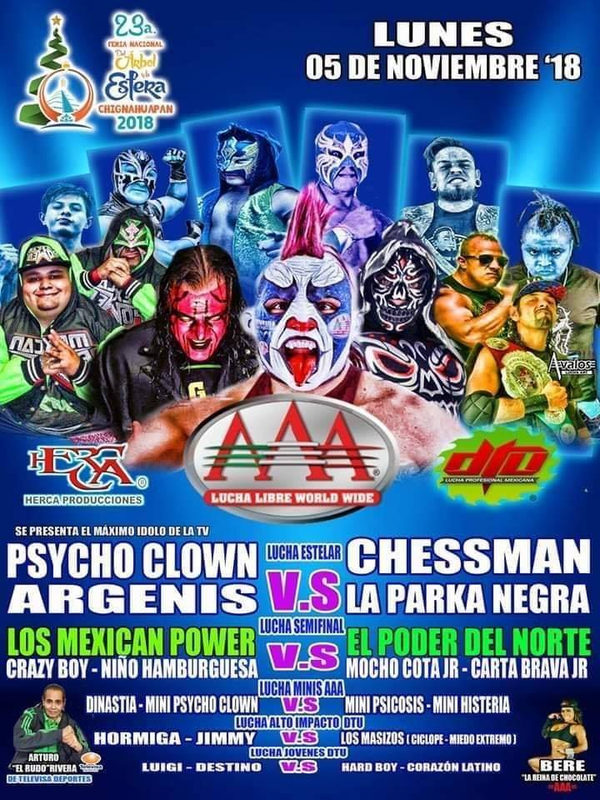 Psycho Clown made the save. 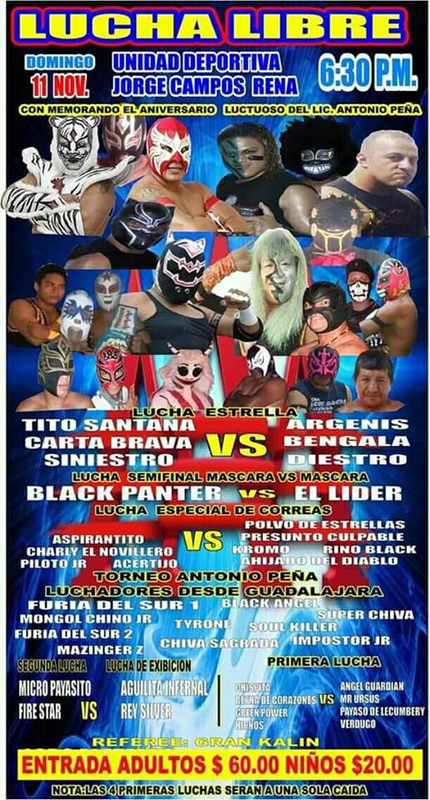 2) Darker, Príncipe Neza, Thunder Storm b Príncipe Caballero, Rey Caballero, Shaman Jr.
tease of Mascara/Maximo happening here in December. 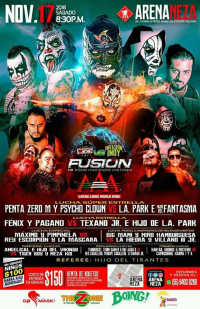 6) Fénix & Pagano DQ Hijo de LA Park & Texano Jr.
DQ when Texano unmasked Fenix. 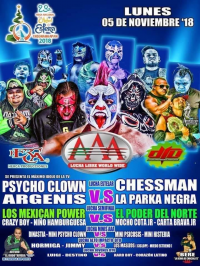 DQ when LA Park hit Tirantes but tricked the referee into thinking Psycho Clown had done it. 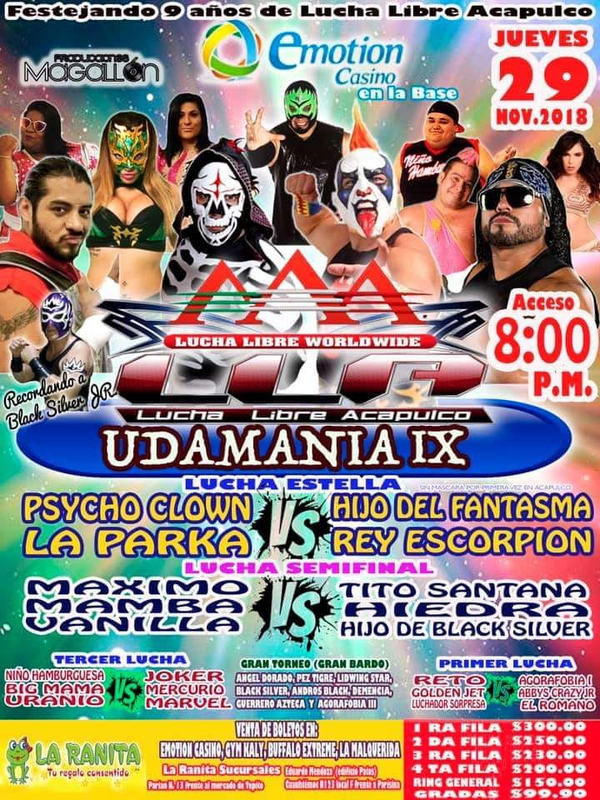 8:39. Zafiro replaced Scarlett, who Vampiro says did not make the show due to situations out of their control. 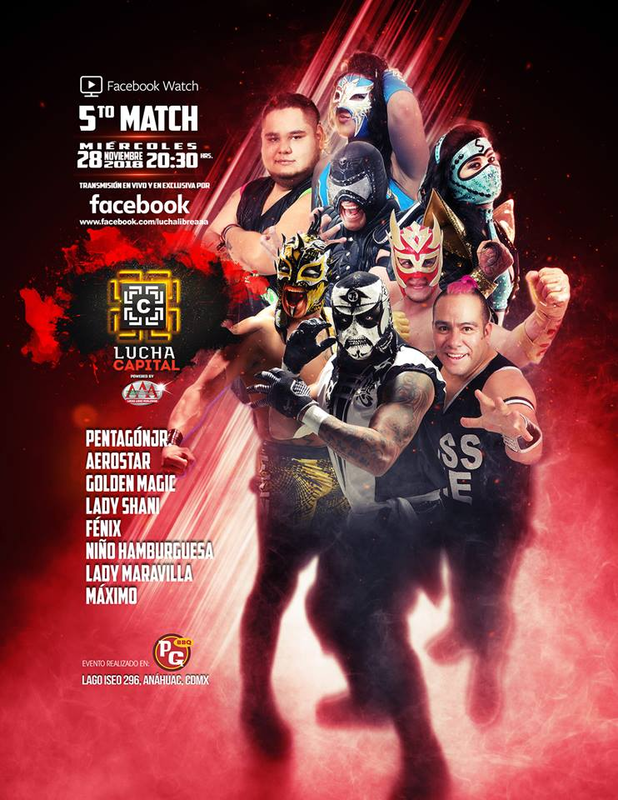 Lady Shani beat Lady Maravilla with a spinning Gori Special. 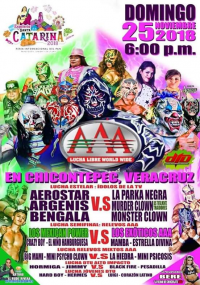 Keyra and Shani both declared they'd be the next AAA Reina de Reinas champion, then got into a mask pulling brawl that had to be broken up twice. 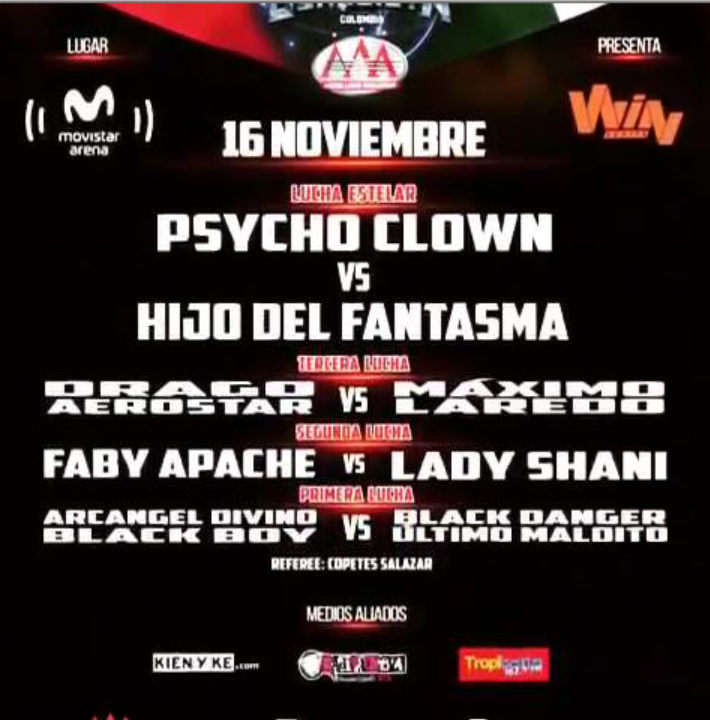 8:57. 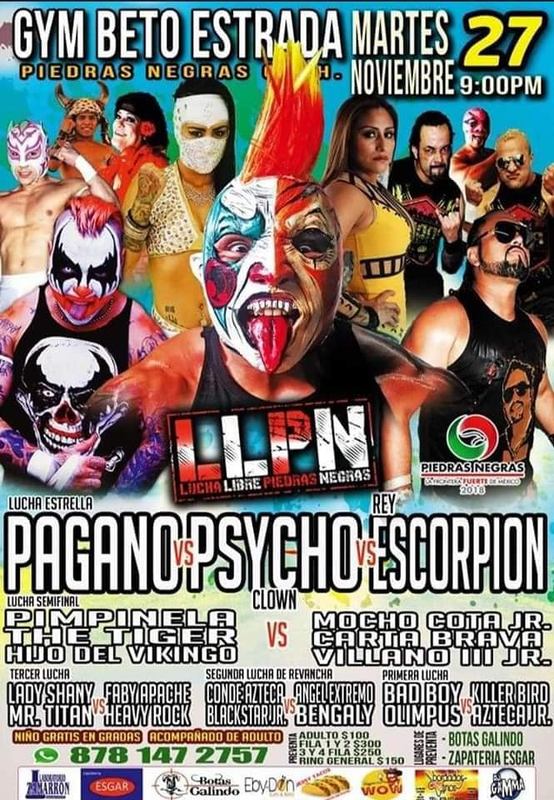 Hijo del Vikingo beat Tito Santana with a imploding 450 splash. 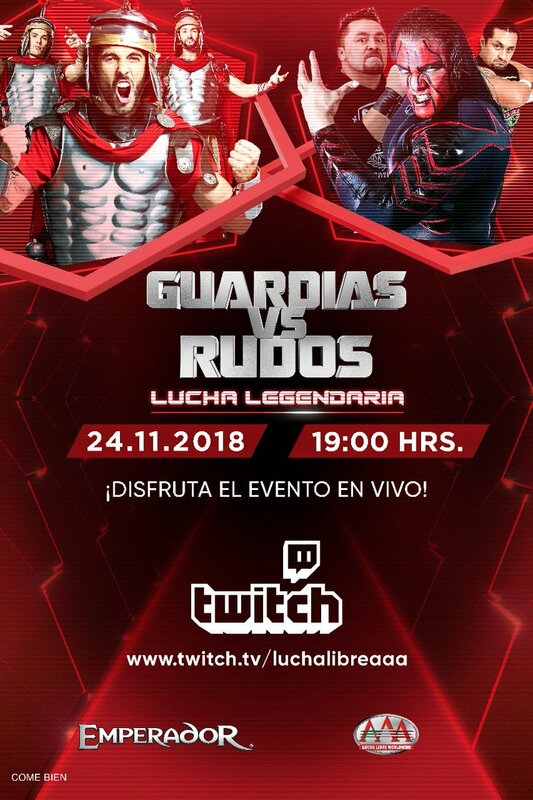 11:04. 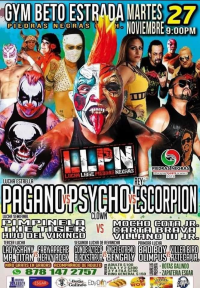 Earlier in the show, Psycho & Parka protested teaming with Demon. 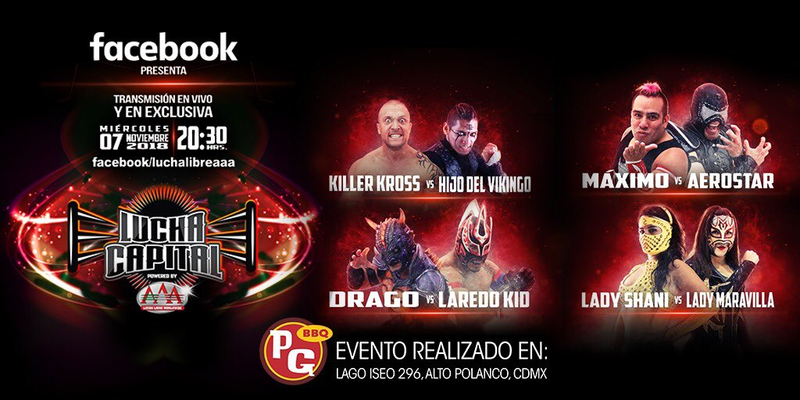 They were interrupted by Fantasma, Texano and Konnan. 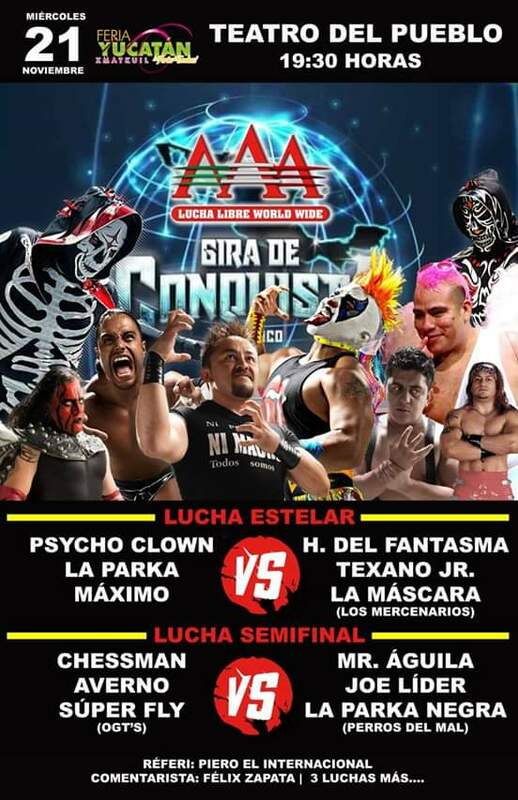 Fantasma called them unprofessional for not teaming with Demon, said he'd beat Drago at Guerra de Titanes, and said he'd get the mega title after Cage beat Fenix. 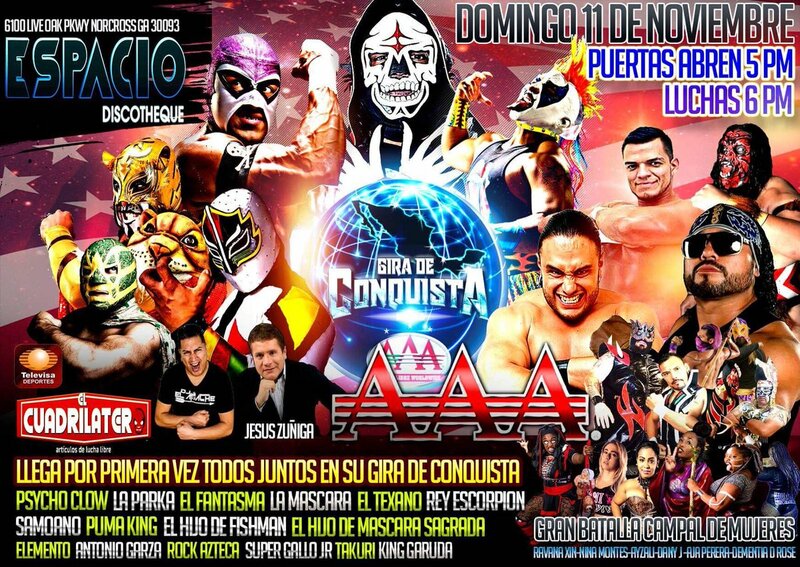 Cage was not happy with this, and was eventually attacked by the rudos. 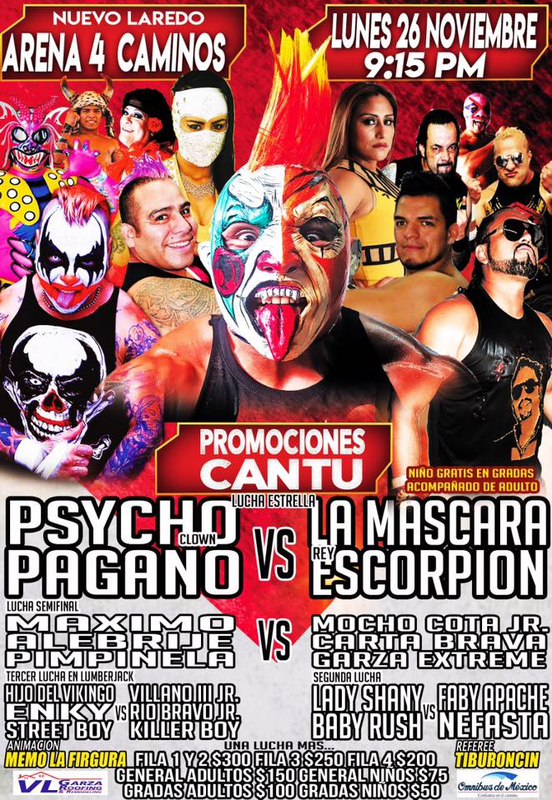 Psycho & Parka thought about it and made a save. 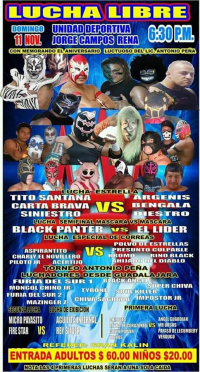 Blue Demon attacked them. 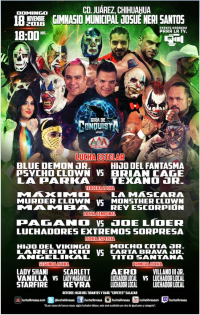 Cage & Demon changed sides in the main event and Cage appears to be a tecnico going forward. 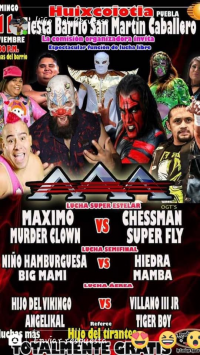 Cage pinned Texano with a F5 after Demon fouled Psycho. 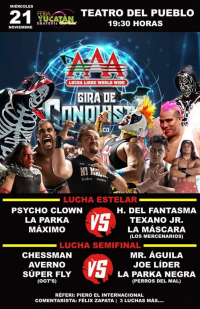 Those two fought to the back after. Event Notes: Sponsored show with giveaway tickets, streamed on Twtich. 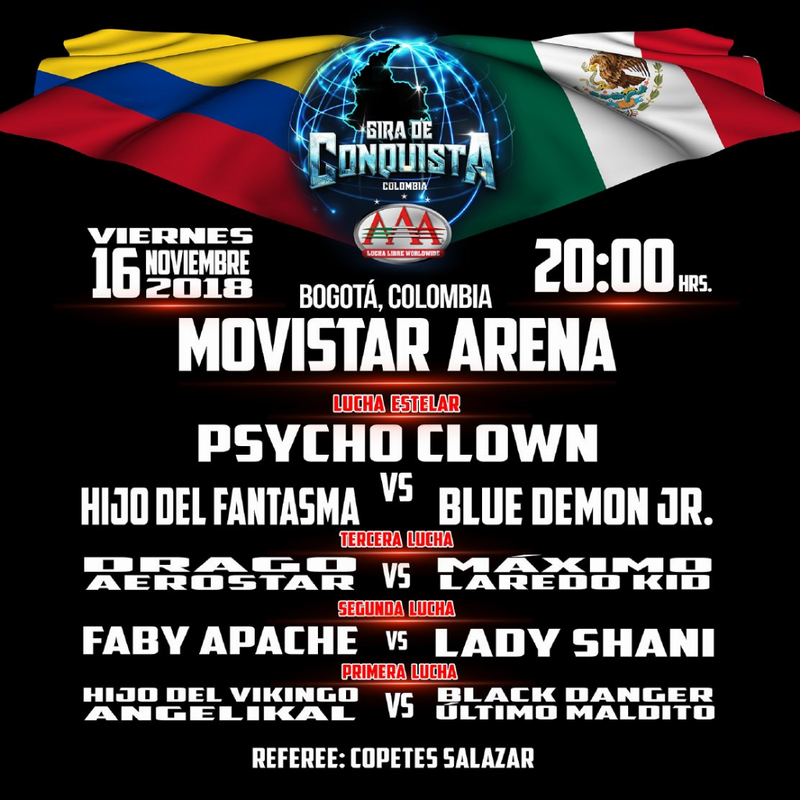 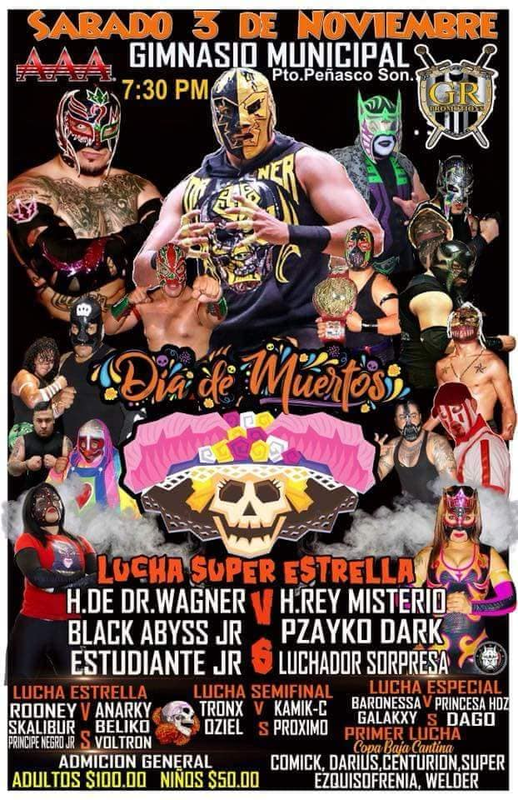 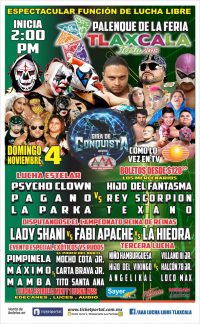 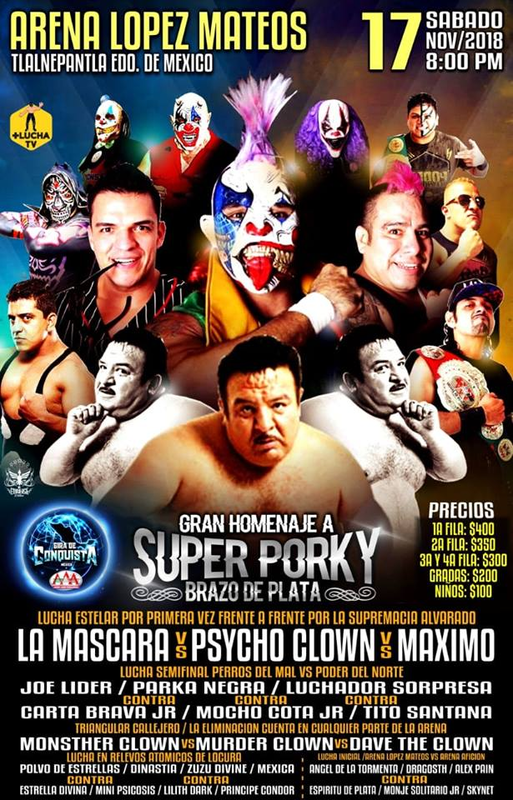 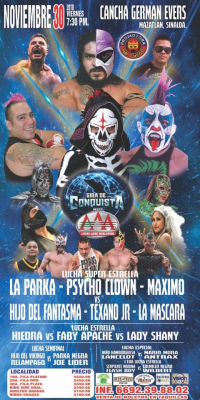 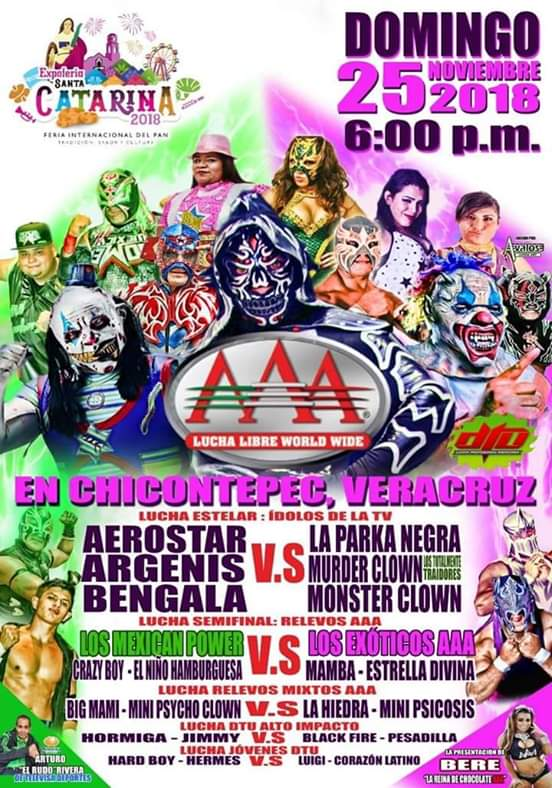 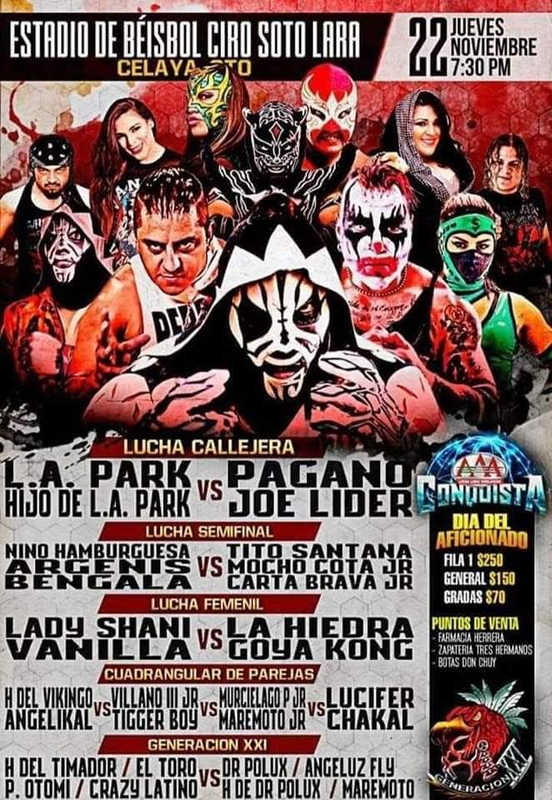 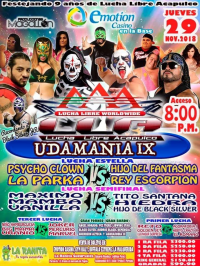 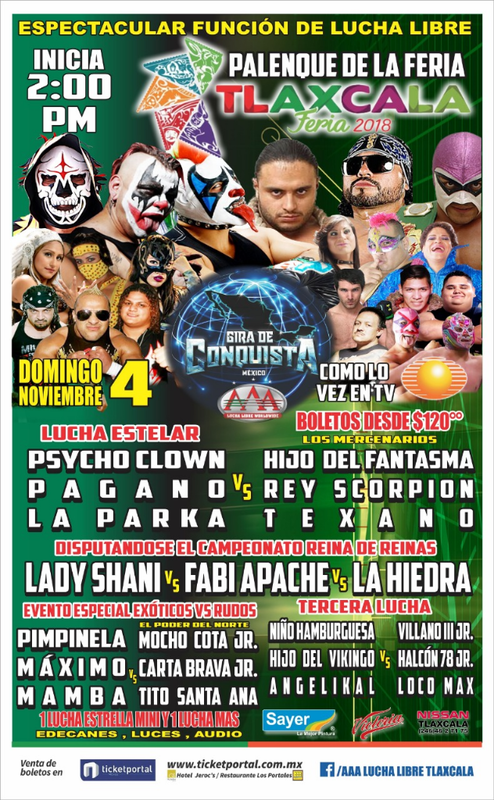 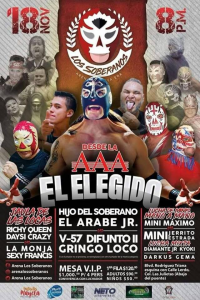 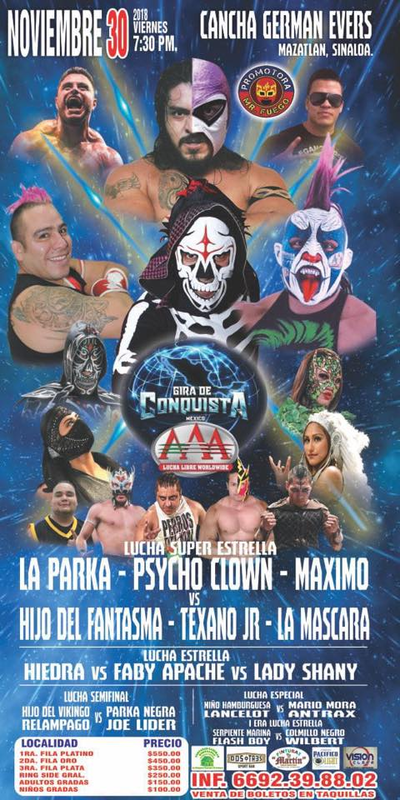 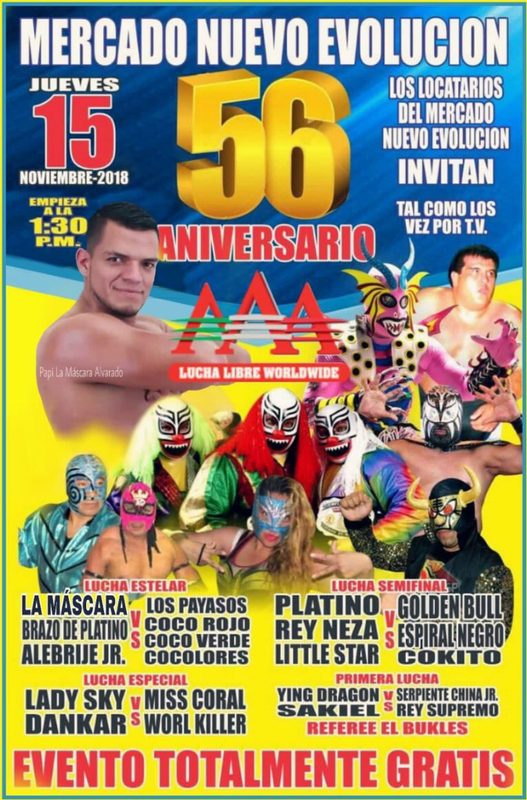 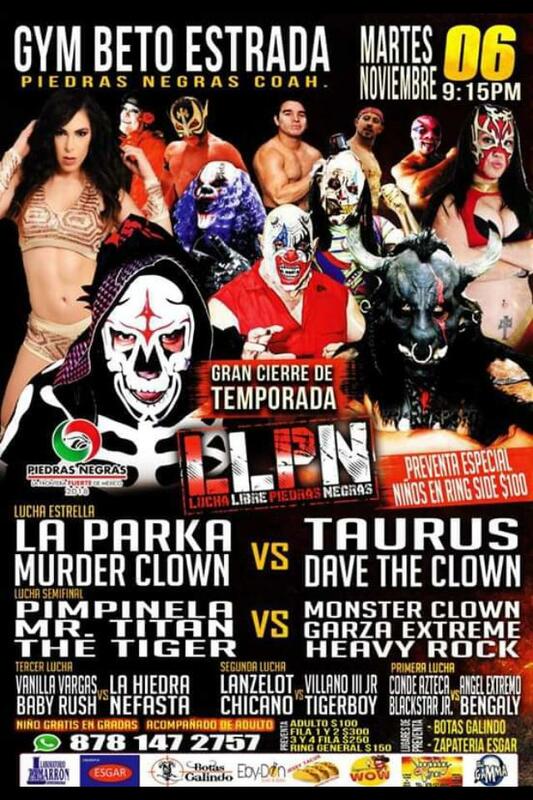 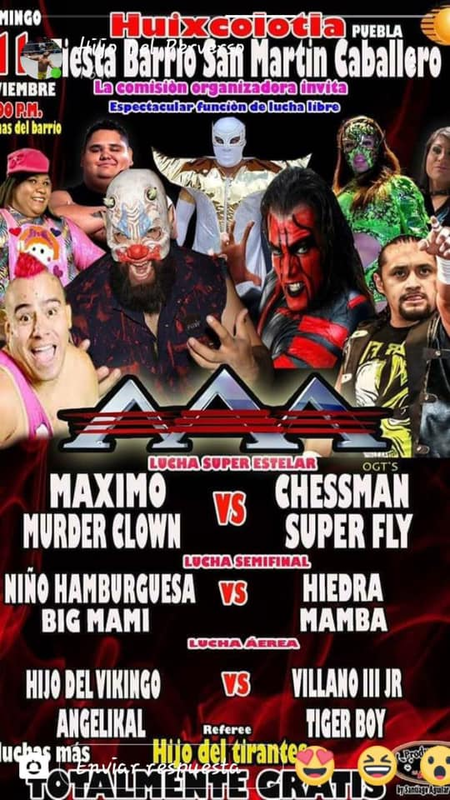 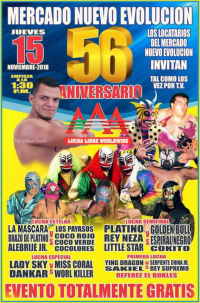 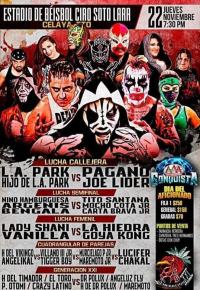 5) Lady Shani, Máximo, Pimpinela Escarlata b Faby Apache, La Máscara, Villano III Jr.
4) Hijo Del Vikingo, Pimpinela Escarlata, The Tiger vs Carta Brava, Mocho Cota Jr., Villano III Jr.